Answer: Payday loans are rarely a good solution. When people need a few hundred bucks to tide them over until their next check, payday loans might seem like a good idea, but don’t be fooled — it is a trap. In 2016, the Pew Charitable Trust reported that 12 million Americans take out payday loans each year, and pay $9 billion on the loan fees. Payday loans come with high interest rates, typically around 400 percent. Because the lending limits are low — most payday loans range from $100 to $500 — some rationalize that the fees are worth the cash. Unfortunately, that’s rarely the case. Payday loans are short-term cash loans, usually due within two weeks of taking out the loan. The process of securing a payday loan is simple: You give the lender a postdated check (or authorize access to your bank account) for the dollar amount of the loan plus the interest. Then the lender gives you the cash. When the loan is due, the lender can take the payment directly out of your bank account, or you can extend the loan for another two weeks for another fee. Oftentimes, the payment is about $15* for every $100 you borrow. If you take out a $300 dollar loan, the projected interest would be about $45. There would be a $45 additional payment if you cannot repay the loan after two weeks. • Within one month, you will have paid $90 for a $300 loan. • In two months, it would cost $180 for a $300 loan. • In six months, it would cost $1,080 for a $300 loan. • In one year, it would cost $2,160 for a $300 loan. 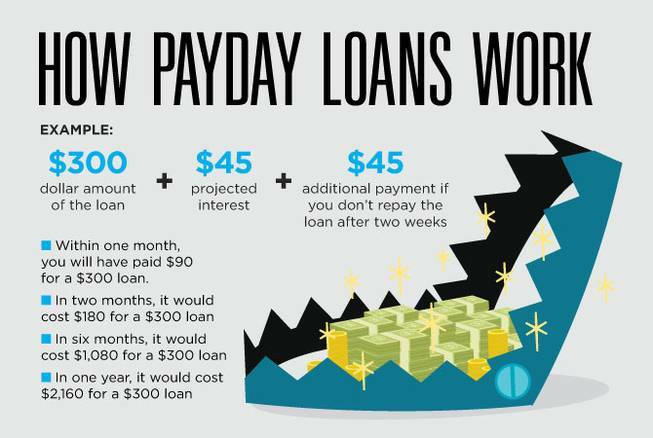 *Note: $15 is a rounded estimate, and a bit lower than many payday loan companies offer. Pew reports that the average annual percentage rate for payday loans is 391 percent. Depending on the specific lender, it might be slightly more or slightly less. For the Pew-reported average of 391 percent, it would cost borrowers about $16.29 in fees for every $100 borrowed. Pew reports that 58 percent of average payday loan borrowers struggle to meet their monthly expenses and the average payday loan requires a payment of $430 by the end of the lending period. Further, 75 percent of payday loans belong to people who take out 11 or more payday loans a year. While banks and other mainstream lenders typically don’t offer small-sum loans, taking out a payday loan until your next paycheck is never financially advisable. Alternative options may be limited in most of these cases, but considering a payday loan or falling into the payday loan cycle is almost always indicative of a larger financial issue. Unsteady finances can carry a heavy burden of shame, but those feelings should never prevent one from seeking help. The large majority of Americans carry some form of debt — 12 million people take out payday loans each year, and the total credit card debt owed by U.S. consumers is more than $1 trillion, which is the highest ever. Accountants, attorneys and financial advisers, among others, can be of great assistance to people who are trapped underneath any type of debt. If you’re considering a payday loan, or already stuck in a payday loan cycle, it’s time to take a hard look at your financial situation and figure out what’s causing the problem. If you have other debts or garnishments causing your struggles, consider seeking help from a reputable debt relief attorney. If you don’t have debt but you’re living paycheck to paycheck, it may be time to try and cut expenses, sell some assets, pick up a second shift or maybe even get a roommate. Regardless of your financial situation, payday loans should be avoided at all costs, especially around the holidays.